This blog post will focus on telephone books. The first Chicago telephone book appears to be The Telephone Journal, vol. 1, no. 1, published in October 1878. (For a short history of the telephone in Chicago see FundingUniverse.com's page for Illinois Bell Telephone.) The first book includes information about the telephone service along with a three-page “List of Subscribers”--names of businesses and a few individuals along with an address and numbers for “wire” and “call.” It also includes a three-page “Business Directory” which lists establishments by category much like a modern yellow pages. Curious to know if your ancestor was an early adopter? Check the three subscriber pages linked from the top of this post. The printouts weren't the best, but the images should be readable. Make sure to check out the instructions for how to make a call on the top of page one. Reading them made me grateful for my cell phone. As you'd expect, the number of subscribers increased year by year and the later books include many more personal names than the earlier volumes. I didn’t explore in detail, but it appears, at quick glance, that the books mostly include heads of household much like the city directories do. If you're researching the early years when city directories are available, I think they're the first-choice resource. A quick comparison of an 1886 city directory and telephone book makes that pretty clear. But, if you're researching a family in the gaps between city directory years (1918-1922, 1924-1927, and after 1928) and need to know an address or establish that they were living in the city, the telephone books might be useful. Unfortunately, the later directories have tiny print and I found the one film I checked (from the 1930s) challenging to read. I don't think I could have gotten a good printout of it but I could have read it well enough to make a careful transcription to go along with a paper copy. I'm planning to offer lookups in the Chicago telephone books in the near future. I don't expect to get many requests, but I think the research might occasionally be helpful. I wonder if the early phone book would be an indication of the status of that individual. His value in spending, etc. Or maybe a person was just lucky to live where it was installed? Interesting. I am going to try and see if I can figure out how to find someone who is rumored to have died in chicago fire. I suppose to early for phones. But maybe another directory of some sort. but she would only have lived there a year or less. It would be interesting to compare telephone book entries to census entries that show the value of real and personal property. I am pleased to know that these telephone directories are available at the Harold Washington Library. This is a huge help to us out-of-town researchers to know that we can compare City Directory and telephone book entries for the same family. I am helping an adoptee search for birthfamily. We think we may have birthfather's family, but birthmother has been a difficult search. 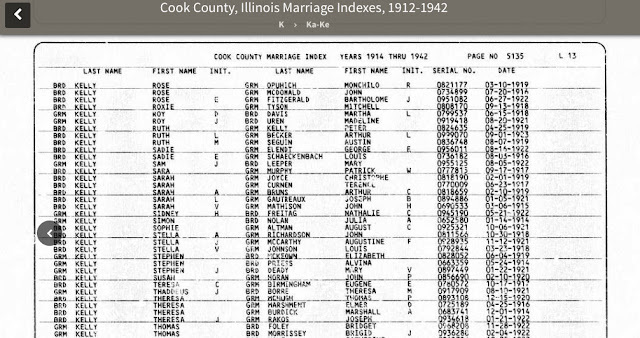 We have her address (hopefully not falsified on original birth certificate)but birth was in 1956 (Chicago) and databases available online do not go that far back in time. We also have occupation and place of employment (??) for birthfather, but company does not show up anywhere. Looks like I will have to make a trip to the Library. The adoptee lives in another state. Have you had any more experience with the later telephone books? I want to go look at some of these at the Harold Washington Library, but specifically from the late 20s - mid-40s. However, if they all tend to be a mess, it might make more sense to go to the Newberry? Are these phonebooks online somewhere? My grandfather owned several establishments but one of them was called "The 900 Club." 900 was part of the street address, but I don't remember which street. I would love to know exactly where that was so I could possibly locate a photo of the bar or at least the neighborhood it was in.